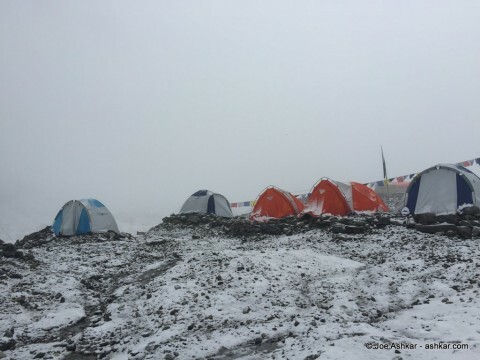 Woke up to a snow blanketed Base Camp and sad news today at both K2 and Broad Peak Base Camps: 1 fatality and 2 injuries including a serious one. An avalanche on Broad Peak crushed a high altitude guide/porter accompanying a Chinese and Japanese climbers. The porter perished under the avalanche and the other two climbers suffered massive injuries. It was very impatient to go up either K2 or Broad Peak this morning due to the heavy snow we received overnight. Our group is safe at BC and we are in a holding pattern as the weather isn’t getting any better. We are in good spirits but very saddened by today’s events. Next Post: K2: Conditions are getting worse!